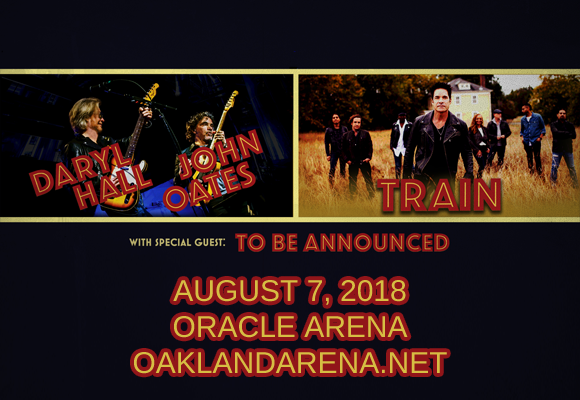 Expect wall-to-wall pop rock hits as two HUGE bands come to Oracle Arena on Tuesday 7th August 2018 – Hall and Oates & Train! Both bands are known as being titans of the radio waves, with Hall and Oates' blue-eyed soul classics like "I Can't Go for That (No Can Do)", and Train's singalong power-ballads like "Drops of Jupiter", so fans will be delighted to enjoy a full headlining set of chart-toppers from both acts! Tickets available now! One of the best-selling duos of all time, Daryl Hall and John Oates first began performing together in the late 1970s, finding fame with number-one hits like “Rich Girl”, "Kiss on My List", "Private Eyes", "I Can't Go for That (No Can Do)", "Maneater", and "Out of Touch". The two-piece has charted thirty four hits on the US Billboard Hot 100 to date, and has released seven RIAA platinum albums and six RIAA gold albums. In 2003, Hall and Oates were inducted into the Songwriters Hall of Fame, and they received a star on the Hollywood Walk of Fame in 2016. They have sold over 40 million albums worldwide.